So much has been written over the years about our over populated Earth. Clearly with a planet that is ecologically far too small for us today, if we didn’t have such a big crowd the problem would be smaller or not even exist. This simple conclusion is often backed up with the responsibility passing adage: “The problem is that the ‘third world’ are producing too many off springs, and in their basic lives and struggle for survival they are destroying the natural environment“. As we shall see, the problem of the crowd as it relates to our ‘Needing 1.6 planets’ dilemma, isn’t as simple? Maybe neither size, nor footprint, nor growth of the third world population, are behind the real ecological problems facing Humanity? Maybe this is a convenient smokescreen for those really responsible? We all know the numbers: The world population is 7.6 (or whatever?) billion today, and growing at some staggering figure of over 2 million per day! Depending who you back this is projected to grow to a ginormous 9 -10 billion crowd, by 2050. 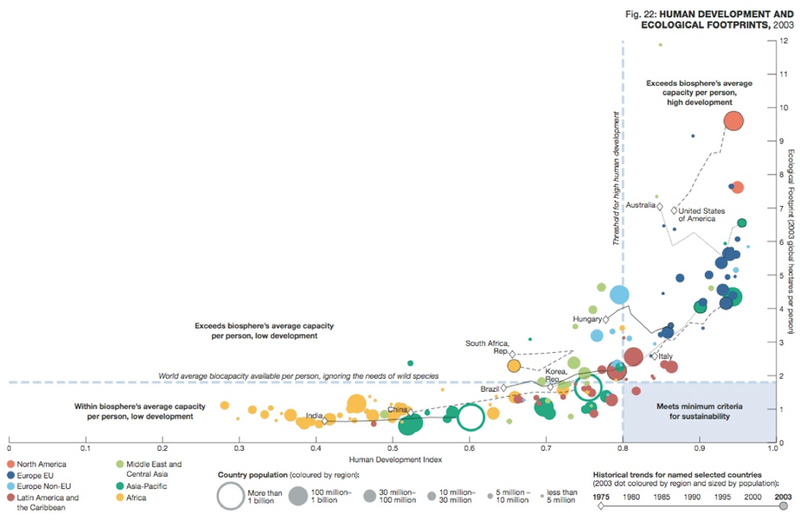 In the context of these population projections, if there was no more improvement in the global Human Development Index and ‘everything else’ stayed the same as today, it is estimated that we would need around 2.0 planets to sustainably house the larger crowd. 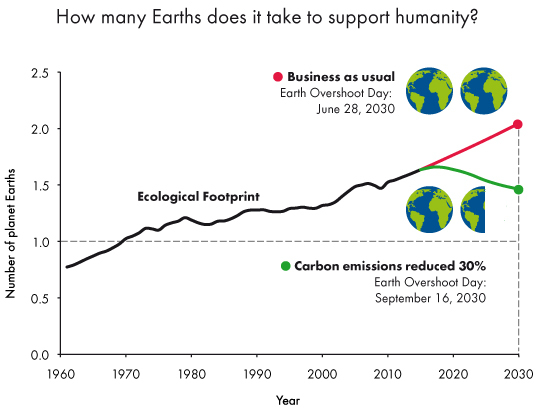 In another, ‘business as usual’ scenario: If global human development across all societies progresses as it is doing today: We would need all of about 2.5 Earths to sustainably house the 2050 crowd. This assumes both the number of people climbing The Good Life ladder, and the number moving higher up each of its rungs follows the trends of today. Interestingly, if today’s 7.6 billion people were all average 3rd world nation people, people who have never put foot on The Good Life ladder we would theoretically need less than 0.5 Earths to remain sustainable! From an ecological standpoint, this would be like going back to the world society and balanced ecological environment that existed in the early 1900’s! There would probably be no talks of Global Warming, strange weather, depleted natural resources, etc…. Maybe there would be less open natural wilderness, less wild life, maybe not? Maybe the world would be a wonderful place? Without the colonialism and western ideology…??? There are arguments for all sides, and this is hypothetical, but the point is that the less developed communities driving the world population increase can ecologically easily afford to have a larger crowd, if ‘everyone’ walked away from The Good Life ladder and lived liked them. The controversial and ‘Success’ challenging opposite of that is: The communities using The Good Life ladder and driving the ‘Utopian Success’, and backing the development of these lesser developed nations are the ones who are in seriously ecological debt. To the point that not only may they need to urgently stop procreating but also to start culling! So yes, our Crowd and is a huge problem, and significant factor in the One Point Zero challenge, but (in a 1.0 context) is not such a simple one as birth rates: rather about size and depth of individual and community footprints. Both of which are directly tied to what defines Success for these entities, and the path it takes to get there.